Winter might be hanging around longer than we expected, but our businesses are ready for spring and have everything you need to bring some freshness back to your life! At Home & Co. - Complimentary one-hour in-home design consultation. $150 value + 20% off upholstery lines. Tooth X Nail - New boutique opening at 50th & France this April! Tooth X Nail is a provider of high quality Crossfit, Lifting, Gym and Yoga apparel and accessories. Harriet & Alice - Local Yarn Shop Day on April 21. Kovanda Plastic Surgery - Hydrofacial at Kovanda Plastic Surgery. Introducing the Hydrafacial to Kovanda Plastic Surgery & Aesthetic Institute for 25% off the regular price of $175.00 for our 50th and France Members and Patrons. Grethen House - Everything you need to mix and match for spring! Shop new arrivals from Veronica Beard, Frēda Salvador, Smarteez, Evam Eva, Zero + Maria Cornejo, and more! Coalition - Morning Social Hour - Mondays - Fridays 7 a.m. to 10 a.m.
Chuck & Don's - Grand Opening Party! 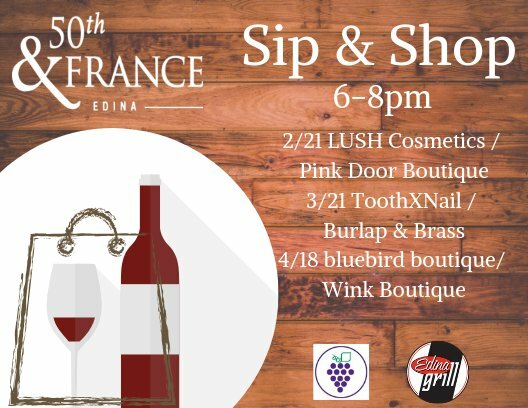 Celebrate our new 50th & France, Edina, Minn. store April 20-24, 2018 with free events and community partners. Enjoy Grand Opening savings too. Red Cow - April Features! Enjoy in addition to Red Cow's delicious regular happy hour and dinner menus. bluebird boutique - New Amuse Society at bluebird boutique! Shop the collection with perfect essentials for spring and summer weather! Burlap & Brass - April showers bring May flowers. Swing into Burlap & Brass for these amazing Spring essentials. Our artist Raincapes and herringbone rain boots. For daily updates of new arrivals follow us on Instagram & Facebook BurlapBrass. Pink Door Boutique - Pretty and edgy styles to make your spring look bloom! Some of our favorite designers include Lauren Moshi, Michael Lauren, Parka NY, Bishop & Young.